His hard work, selfless attitude and abundant humor stood out to professors and classmates, said Melanie Gall, co-director of ASU’s Center for Emergency Management & Homeland Security. Gall taught a graduate class that taught students to use geographic information mapping systems to track biohazards. Humlen-Ahearn also helped his fellow students with their studies by providing feedback or answering questions on the discussion boards and lab chats. 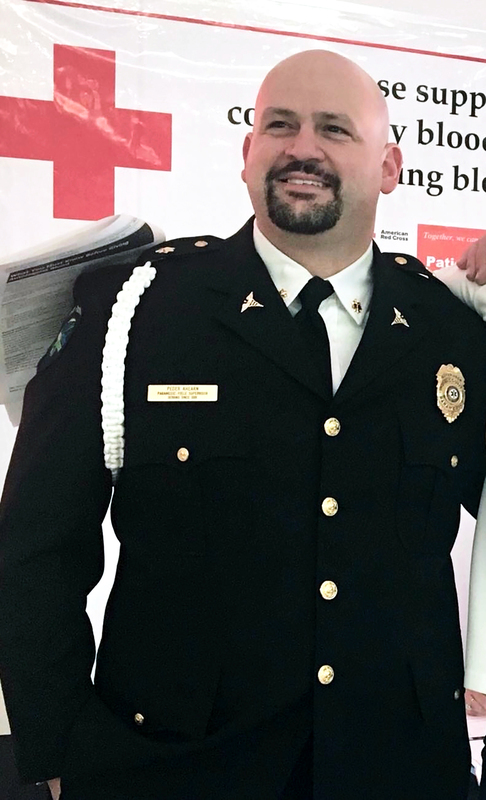 Humlen-Ahearn plans to use his newly acquired knowledge and skills to address a problem that affects first responders nationwide. Some take their own lives as a consequence of the tremendous physiological and psychological stress they endure as part of their job. "Ada County has tragically lost three of our own since 2015," said Humlen-Ahearn. "I want to find ways to make sure our first responder community never experiences the pain of losing one of our own again." QUESTION: Why did you choose your particular degree at ASU? ANSWER: I chose the Master's of Public Safety Leadership and Administration (MPSLA) for a few reasons. First, Arizona State is a prestigious university that ranks as one of the best schools in the nation in criminal justice, public affairs, and public safety programs. Secondly, the MPSLA program was exactly what I needed if I wanted to promote within my agency. More specifically the MPSLA program has the specific coursework I needed to make a difference for my employees. Lastly, a major draw was for the Counter-Terrorism Study Abroad Program in Israel. The study abroad program was one of the highlights of my academic career. Q: What’s something you learned during your program (in the classroom or otherwise) that surprised you, that changed your perspective? A: What surprised me the most was policy analysis. I learned to find the intended and unintended consequences of each potential policy and to develop multiple alternatives. I found that I have a passion for policy analysis and evaluation. In fact, my capstone project and thesis was to perform a policy analysis for creating a postretirement health care plan for first responders secondary to their chances of increased mortality and morbidity. Q: You took classes online and I’m told you went out of your way to help classmates master the material and technology you were learning. Can you talk about that? A: Being in the MPSLA program, we already have a brother- and sisterhood with our classmates. Most of us work in the field already and are trying to make a difference for not only ourselves but our co-workers and brethren. Helping out each other was very natural and easy. Luckily, we have the ability to communicate with each other using discussion boards, YellowDig, phone calls, and hallway conversations. Technology has allowed us to communicate and interact with people from all over in unprecedented ways. Q: What piece of advice would you give your past self when you were first starting school? A: The advice I would give to myself would be to remember that it was all worth it. Getting a master's degree at ASU is an accomplishment, one to be proud of, and a very difficult journey. But it was all worth it. Q: What will you miss most about your experience at ASU? A: I am going to miss the atmosphere. The professors are fantastic and an unbelievable resource. But the student population at ASU in the MPSLA program also have a wealth of knowledge and personal experience that makes learning from each other just as rewarding as learning from our professors. A: I am now two months into my new position as deputy chief. I look forward to taking the knowledge I've learned and applying it to my agency to improve the lives of my co-workers and other first responders. I one day hope that I can be an adjunct lecturer for ASU to give back to the future MPSLA students. I am also contemplating applying for a doctoral program to further my studies, too bad ASU does not have an online program. Q: What is one issue/problem close to your heart that you would want to solve first if you had all the time and resources you needed? A: Nearest and dearest in my heart is to further conduct research on the health impacts of first responders and evaluating ways to reduce their chances of increased morbidity and mortality. I would love to create specific policies, founded by research and peer-reviewed articles, to improve the benefits and life of our country's first responders. … First responders have a great deal of physiological and psychological stress that they endure, and finding ways to mitigate the negative effects would be the greatest accomplishment of all. Education is a gift that has the power to change lives, and Arizona State University’s Class of 2018 — the newest recipients of that gift — now have a duty to use their degrees to make the world a more equitable place, according to this year’s Undergraduate Commencement speaker, the president of the Massachusetts Institute of Technology. “I grew up in Venezuela in a family of refugees who scraped by to make a living, and I remember my father telling me, ‘When you have to leave in a hurry, education is all you can take with you,’” Rafael Reif told the thousands of new degree-holders in the commencement ceremony at Chase Field in downtown Phoenix on Monday evening. “If you have an education, you have the possibility of inventing your own future. I have carried that lesson with me throughout my life,” said Reif, who received the honorary degree of Doctor of Humane Letters from ASU for his achievements in education, science, social entrepreneurship and sustainable futures. Reif, an electrical engineer, focused his scholarship on three-dimensional integrated circuit technologies and environmentally benign microelectronic fabrication. “I grew up in a time and place where education was not a given. It was a luxury. And for far too many people in the U.S. and around the world, it still is,” he said. Reif told the graduates to get jobs that create a better life for themselves and their families. ASU President Michael Crow said that MIT is committed to change in the world and that Reif and the university he leads embrace the same characteristics that drive ASU. “I know he personally embodies the spirit on which this institution is based, one of inclusion, one of research for the public good and of taking responsibility for the community,” he said. Aundrea DeGravina, a student member of the Arizona Board of Regents, implored her fellow graduates to become civically engaged. “We must take our degrees, the connections we made and our unique passions and do something significant and positive,” said DeGravina, who earned degrees in political science and psychology. DeGravina was among more than 15,000 Sun Devils who received their degrees in spring 2018 — 10,400 undergraduate, 4,700 graduate. Of that total, about 8,400 are Arizona residents, nearly 3,000 are online students, including nearly 470 Starbucks partners earning degrees through the Starbucks College Achievement Plan, and 700 are military veterans. Earlier on Monday, the Graduate Commencement was held at Wells Fargo Arena in Tempe for those who earned master’s and doctorate degrees. In total, ASU will hold more than 30 graduation ceremonies this month for the individual colleges and special-interest groups. Twelve Sun Devils are the first graduates of new programs. Ten earned a Bachelor of Science in aeronautical management technology (unmanned aerial systems) from the Ira A. Fulton Schools of Engineering, and two earned a Bachelor of Arts in fashion from the Herberger Institute for Design and the Arts. Crow told the graduates that they are graduating at a time of unprecedented progress. “I have one lesson, and it goes to your mindset: If you are allowing yourself to be affected in negative ways, if you believe the world is a place that is a glass half full or not at some moment of unbelievable potential, then you’re allowing yourself to be deluded,” he said. Crow said the graduates give him great optimism. “Whenever people ask me if I’m worried about the future, I always say no. I say no because I know who you graduates are,” he said.